Here comes football season and the excitement from the players to the spectators is palpable… If you love football….you will love this article. And if you are just a curious soul, there are some noteworthy facts that ought to pique your interest, at least for a minute or two. Speaking of a minute or two, have you noticed that two minutes of football takes a lot more than that? It’s the only game I know that warps time, but at the same time, it does create great entertainment and lasting memories. Did you know the origin of the two-minute warning at the end of each quarter is from the days in the NFL when the official game time was kept by a member of the officiating crew, and the stadium clock was unofficial? Since the late 1960s the NFL stadium clock has been official, but by then television was an important factor in the NFL, so the two-minute warning was retained as a commercial break and to serve as “tension building” time, and thus has become an important part of the game’s flow. David Biederman, of the Wall Street Journal brought forth some really interesting facts. “According to the Journal, a study of four recent football broadcasts, and similar estimates by researchers show the average amount of time the ball is in play on the field during an NFL game is about 11 minutes. In other words, if you tally up everything that happens between the time the ball is snapped and the play is whistled dead by the officials, there’s barely enough time to prepare a hard-boiled egg. In fact, the average telecast devotes 56% more time to showing replays. “ There are 174 minutes remaining in a typical broadcast after the play. It turns out that commercials take up about an hour. 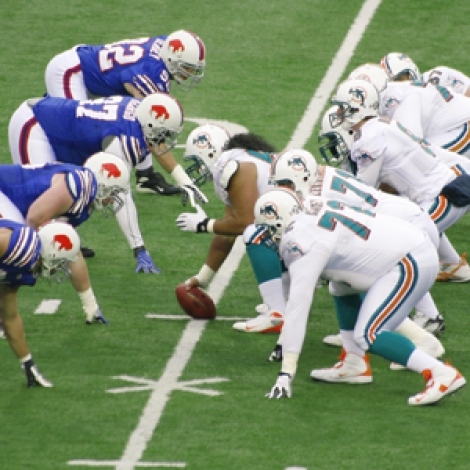 75 minutes, or about 60% of the total air time, excluding commercials, is spent on shots of players huddling, standing at the line of scrimmage or just generally milling about between snaps. In the four broadcasts The Journal studied, injured players got six more seconds of camera time than celebrating players. While the network announcers showed up on screen for just 30 seconds, shots of the head coaches and referees took up about 7% of the average show. Those celebrated players who have been honored for their achievements and for their passion have found their way into The Pro Football Hall of Fame. It turns out The Pro Football Hall of Fame is celebrating its 50th Anniversary of telling the story of the game’s spectacular history. For 50 days, which started on July 20, 2013, they are counting down to the 50th birthday on Saturday, Sept. 7th, and feature a fun football fact in 50 words or less. - Learn more at: www.profootballhof.com I gathered some fun facts I thought you would enjoy. And remember, In the game of life, nothing is less important than the score at half time, so make every moment meaningful and bring unbridled passion to your life. L’Shana Tova to our friends celebrating the Jewish New Year. The coldest game in NFL history was the 1967 NFL Championship Game between the Dallas Cowboys and the Green Bay Packers. Now known as the “Ice Bowl,” the gametime temperature in Green Bay was -13 degrees with a -48 degree wind chill. Hall of Famer Don Shula served as head coach of the Baltimore Colts from 1963 to 1969 and the Miami Dolphins from 1970 to 1995. He concluded his 33-season career as the winningest head coach in NFL history with a career mark of 347-173- 6. The Brooklyn Dodgers and Philadelphia Eagles played in the NFL’s first televised game on Oct. 22, 1939. The game was broadcast by NBC to approximately 500 TV sets then in New York and visitors to the RCA Pavilion at the World’s Fair in New York. Gale Sayers was the youngest person to be enshrined in the Pro Football Hall of Fame when he was inducted with the Class of 1977 at 34 years old. The oldest to enter the Hall of Fame is Ed Sabol who was 94 when he was enshrined in 2011. Two major name changes occurred on June 24, 1922. The American Professional Football Association was renamed the National Football League and the Chicago Staleys, the reigning league champions, were relabeled the Chicago Bears.